For an easy-to-print Adobe Acrobat PDF version of this essay, click here. Warning!! This essay has the potential to blow your mind! Proceed with caution. Here are some important points now that December 21, 2012 has passed. When I say that this message is timeless, I mean that it was as meaningful to the Maya 2,000 years ago as it can be for anyone at any time. Because of this, I feel that my book and free essays are helpful to anyone who is still interested in this subject. To the best of my knowledge and in my opinion, I am the only one that presents both the relevant astronomy and the correct message. For me personally, the discovery of this material was totally mind-blowing. Perhaps you will have a similar experience. * Note: I am open minded to the idea that there will still be a profound shift in the near future. More on that a little later. As I explored the puzzle of 2012, one of the things that I least expected turned out to be the most important. My exploration of this subject was initially focused on the astronomy that will unfold on December 21, 2012 and this is indeed crucial in understanding why the Maya picked that exact day. While this essay will talk a bit about the astronomy, it will mainly focus on something completely different. It will focus on the psychedelic effects of the chemicals that the Mayan shamans got from the Bufo toad. Their psychedelic experiences are the key to understanding the message of the ancient Maya. • The astronomy that will unfold on the precise day that the calendar restarts can be said to metaphorically represent the triple rebirth of the sun. • The process of enlightenment can be said to unfold metaphorically as the triple rebirth of you. So the Mayan calendar points to the triple rebirth of the sun, which points to the enlightenment process. • First, you think you exist fundamentally as your physical body. • Next, you think you exist fundamentally as your soul, which associates with your body. • Finally, you clearly understand that you exist fundamentally as pure Awareness, which is not a thing or an object. Not only is this formless Awareness the source of both your soul and your body, it is the Source of all form, the Source of all of creation. And this is what you truly are. In the third stage, you no longer understand yourself to be a sentient being of any kind, physical or spiritual, and instead, you understand that you exist fundamentally as this power of sentience, as this open capacity for experience. In other words, you are not a sentient being, you are sentience itself! Most spiritual people are in the second stage since they see themselves as a soul on an adventure of growth and self-discovery. Most of them have never contemplated what it means to understand yourself as pure, formless Awareness. Perhaps this essay will provide a good starting point for that. It will also be important to make a distinction between Awareness and consciousness so I will touch on that later. It will be very easy for us to quickly understand why the astronomy that will unfold on that day is so special and why it was used as the foundation of the Maya’s triple rebirth metaphor. After you see how I present the astronomy of 2012, you might wonder how so many people can be completely unaware of this simple but important perspective. 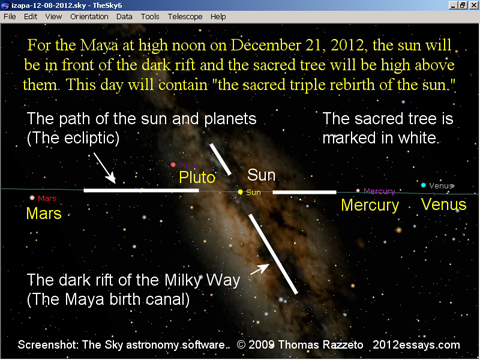 The sun will be in front of the dark rift - the Mayan birth canal - on the winter solstice of 2012. The sacred tree will be above the Maya with the sun virtually exactly between Mars and Venus. On the precise day of the winter solstice of 2012, the sun will be in front of the middle of the dark rift of the Milky Way. This section of the sky contains a large ball of faint stars near the center of our galaxy. 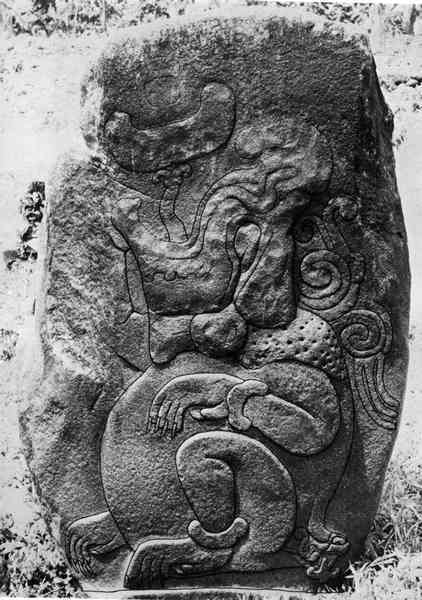 The Maya considered this ball to be the pregnant belly of the mother of creation. The dark rift intrudes into this ball and was considered to be the galactic birth canal. From the point of view of earth, the sun goes through this section of the sky once a year and on the one day of the year when the sun is in front of the middle of the galactic birth canal, it can be said that the sun is being reborn. In the years around 2012, this happens on the same day as the winter solstice. Since the winter solstice is the time when the length of the day starts to grow longer, it was also considered to be a type of solar rebirth. And of course, every day contains a sunrise, which is yet another type of solar rebirth. In this way, December 21, 2012 contains a triple rebirth of the sun. So we see that on the day that the calendar itself will be reborn, the sun will be reborn three times. But understanding the link between the calendar and the astronomy does not answer the biggest question: What are the Maya trying to tell us? It is my opinion that this astronomy will not cause anything unusual to happen to us, either good or bad, physically or spiritually. I think that the ancient Maya also held that belief, although it seems that some superstitions were added later. For the ancient Maya, this astronomy was the foundation of the profound metaphor of transformation and rebirth. Indeed, this metaphor points to the Maya’s deepest understanding of the true self. Let’s look into this idea of rebirth a little more right now. According to John Major Jenkins, the purest meaning of 2012 is found by examining the stone monuments and carvings in Izapa, Mexico, the birthplace of the Long Count calendar. This is the most immediate and primary evidence left by the Maya. Here we find that these monuments depict both the astronomy of the triple rebirth of the sun and the general theme of transformation and rebirth. One of the ways that the Maya present the theme of transformation and rebirth is with images and statues of the Bufo toad. The transformation of the tadpole into the toad makes it a perfect symbol for the process of transformation. If you did not know any better and someone showed you both a tadpole and a toad, you might think that they were two completely different types of creatures and yet one comes from the other. Amazing! In addition to that, the adult Bufo toad sheds its skin about four times a year. The young ones do it much more often. As they shed their skin, they eat it. It is almost as if they unzip it along their backs and then pull it into their mouths. So the old outer form is consumed in order for it to come forth again, born anew within the body of the toad. This act of consuming its skin is depicted in the stone art of the Maya. While those things are interesting, it is the next piece of the puzzle that is the most important. It just so happens that the Mayan shamans used the psychoactive chemicals excreted from the poison gland of the Bufo toad during their sacred rituals and in this way, each shaman had a direct, personal experience with what they called “the invisible world,” “the unseen world,” or “the underworld” and what we might call the spirit world. The Maya and their predecessors, the Olmec, were very interested in the Bufo toad. The shamans kept them in ranch-like areas. Thousands of skeletal remains of these toads have been found and it seems as if the Maya and the Olmec created sacred burial sites specifically for these toads. One example of this is located in San Lorenzo, Mexico and it dates back over 3,000 years. In his book Tryptamine Palace, James Oroc describes the effects of the psychedelic chemicals from this toad. By the way, the main chemical is called 5-MeO-DMT and it has different effects from other types of DMT from different sources such as the vines used to make the ayahuasca brew that is well known in South America. I want to clearly point out that this chemical is both illegal and risky, and that the toad is close to extinction. This is why I don’t recommend it. In general, I see psychedelics as a valid path for self-discovery even though I prefer meditation instead. I trust you know your own path so let’s continue. Oroc states that he had the experience of becoming “consciousness without identity.” Since similar comments have been made by others, it is extremely likely that the Mayan shamans also had very profound experiences. 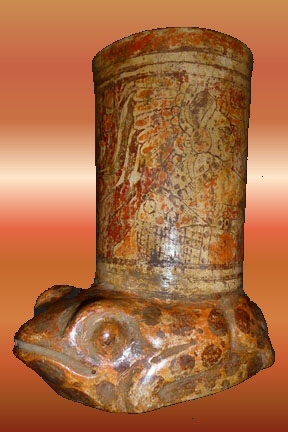 A Mayan Bufo toad ceremonial drinking vessel. From Keith Cleversley's private collection. Photo by Keith Cleversley. Used by permission. Mainstream science holds that your consciousness arises from the biochemistry of your body and brain. But what if your consciousness does not depend upon your body for its existence even though it uses your body as a window into the physical world during normal states of consciousness? Honest scientific research into out-of-body experiences, near-death experiences and past lives supports this idea. Your awareness seems to be personal since it brings you your personal experience. With your awareness, you experience your own unique bodily sensations, your own emotions, your own thoughts and even your dreams and more. Since my bodily sensations, emotions and so forth are all different from yours and completely inaccessible to direct perception by you or anyone else, it seems as if we are all separate, mortal, sentient beings. But what if this is just an illusion? I will continue with this very important question in just a few minutes but first I want to get back to the Maya. It is now very clear to us that the Bufo toad does more than just physically demonstrates the principles of transformation and rebirth, it also provides the Maya with a means to explore the spiritual world and most importantly, to discover the true fundamental self. I think that the presence of the Bufo toad in the sacred ceremonial site of Izapa speaks volumes. In fact, the statues were not just used as symbols; they were used as altars. This raises them to the highest level possible. This is strong evidence that in the eyes of the Maya, these psychedelic experiences were supremely important! So the Maya are focused on the core meaning of the rebirth metaphor, not the time of 2012. That is just the time when the astronomical metaphor will unfold. The calendar merely points to the astronomy which points to the timeless rebirth metaphor and the awakening process. If I write a poem about enlightenment and spiritual awakening and use the sunrise as a metaphor since that is the event that fills our dark world with light and we are all awakened from our physical slumber, the poem should be taken as a reminder that spiritual awakening is possible in a general sense. It certainly should not be understood to say that we are all going to become enlightened during the next sunrise, although that might happen. If people focus on the event of the sunrise because they think that enlightenment will happen at the time of that event, they will have missed the point of the poem. The same thing is true for the sacred triple rebirth of the sun in 2012. It is a reminder that we can all awaken to a new spiritual understanding at any moment. Focus on the concept of spiritual rebirth, not the time of the astronomical event that was used as the foundation of the rebirth metaphor. Almost all calendars are based on astronomy and it is beyond a reasonable doubt that this is also true for the Maya calendar, although in a rather spectacular way! And very often the messages handed down from ancient people are metaphorical, not literal, since this can more easily point to timeless spiritual wisdom. In this way, I believe that the message of 2012 is timeless. If the focus of the calendar is timeless and everyone is looking for a literal event (other than the astronomy), they will miss the whole point of the calendar. In my opinion, the conditions of the world are not at all the point of the message of 2012. That is just the outer form of creation and everything that has been created will change. The message of 2012 is much more profound. It is about something that never changes. It is about the fundamental principle of reality, as revealed by the psychedelic experiences of the shamans. The ancient Maya discovered the greater reality that lies behind our ordinary reality and most importantly, they discovered their true fundamental self, which was never born and will never die. So the questions of 2012 are: “Who am I?” and “What is the true nature of reality?” Asking what is going to happen to us in 2012 is much too superficial. Of course I am well aware that many people think that 2012 is about a shift into a new golden age of world peace. Just because I don't think that the ancient Maya themselves created the calendar to predict world peace at this time does not mean that we can't create a beautiful world right now! Your desire for world peace arises from your strong feelings of compassion and love and yet we should be honest and acknowledge that we do not have the power to make someone else happy; we do not have the power to make someone else be at peace. That is up to them and to them alone. Yet perhaps your attitude and action will inspire others to create peace and joy within themselves. In this way, we all can work towards a more peaceful world. Your inspiration and offer of a helping hand to build a better world together can reach out in ways whose limits are unknown. So never give up hope and always do your best to transform both yourself and the world around you into yet an even more beautiful reflection of the divine love that comes to us all from the Source of everything. People all around the world throughout all of time have discovered that both God and creation are the same reality, somewhat like water and ice. Ice doesn’t just come from the water, it is the water. This understanding is sometimes called “mysticism” and I believe that this mystical awakening is at the heart of this timeless message from the Maya. So let’s get back to the triple rebirth of you and the three identities that I mentioned at the beginning: the physical body, the spiritual body (the soul) and pure awareness, which is a formless reality without a body of any kind, either physical or spiritual. With this understanding, both physical and spiritual bodies have some form to them while this awareness, this power of sentience, this open capacity for experience, is completely formless. This awareness is not a thing, an object or a being. Paradoxically, this awareness perceives, but it cannot be perceived. And this awareness is what you truly are fundamentally. In my opinion, the materialist view is completely shattered with out-of-body experiences and other experiences, including some psychedelic experiences, but of course we know that the skeptics push back with the claim that all of that is just internally generated hallucinations and that these experiences have nothing to do with the objective world. While that is a testable hypothesis – which has been shown to be false – I will simply put that discussion to the side and continue. Spiritual seekers know that adopting a new identity as a spiritual being rather than a physical being is a big step. They also know that there will still be much more growth after that reidentification. But what almost no one understands is that there is still one more profound reidentification waiting for them. The next reidentification comes when you learn that you are not fundamentally a being of any kind, physical or spiritual, and instead, you understand yourself as pure awareness. And yet again, even after that last reidentification, there is still more growth to come. As this wisdom deepens within you, you recognize that the awareness that is looking out of your eyes is the same awareness that is looking out of everyone’s eyes. There is only one awareness. Furthermore, this awareness is the Divine Awareness, the only reality that was not created. This Divine Awareness is the source of all of creation and it is the only witness to it. This Source-Awareness is your fundamental identity and it is looking out of your eyes right now! Earlier I mentioned that it is important to make a distinction between awareness and consciousness so let’s take a quick look at that. First of all, as I just touched on, what seems to be your own personal awareness is instead the One Divine Awareness. But you do have your own personal consciousness (your soul). Your personal consciousness is like a window through which the One Awareness looks. And here is an important point: a window cannot see anything at all, it only provides a point of view for someone to look through. The following analogy will help us understand how the One Awareness and the many personal consciousnesses (souls) work together. Imagine you are the One Awareness and that you are in a room with many windows. When you look out into the world through one of these windows, you see a certain view. In this way, you have all the experiences of one particular person. You see what they see, feel what they feel, think what they think, remember what they remember, dream what they dream and so forth. When you look through a different window, you have all the experiences of a different person. But you are still the same Awareness; this has not changed in any way. If you experienced all of these perceptions altogether through one big window, it would be just a huge jumble of color, noise and so forth. To fill out the metaphor a little more, you can say that your body is a window into the physical world and when your soul permeates your body, as it does in your normal state of consciousness, the windows of your body and soul line up and the One Awareness uses the two together to perceive the physical world. A similar thing can be said about nighttime dreams. At that time, your soul permeates your dream body and the One Awareness perceives the dream world through that combination. In this way, the One Awareness experiences the lives of billions of different people without it being one big, messy overlay. This is how the One seems to become the many. This is a tremendous mystery and it will never be fully explained. And yet I offer a sliver of a description of what is going on. I think that the Maya personified the sun because you are like the sun. From our perspective on earth, the sun seems to be born when it rises and die when it sets. But from a perspective out in space, we see that the sun does not go through this daily cycle of birth and death; it is essentially eternal. Similarly, from the perspective of our ordinary reality, it appears as if we are born and then later, we die. Is there a different perspective, a larger framework, that reveals that our true self, our fundamental unconstructed self, is indeed also free from this cycle of birth and death? Are we also eternal? I think so and I think this is the message the ancient Maya offer us with their Long Count Calendar. Thanks for reading my essay. I hope I have given you some interesting and fun things to think about. Written May 1, 2011. Edited for clarity on April 12, 2019. By the way, John Major Jenkins passed away in July 2017. Rest in peace, John. Thanks for being a friend. If you found this essay intriguing, perhaps you will enjoy my books. For more about the Maya, I offer Mystical 2012: The Triple Rebirth of the Sun and the Triple Rebirth of You. You can still buy the paperback or ebook at Amazon.com or read many of my free essays at 2012 Essays. 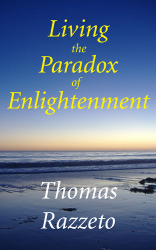 If you like my work on spiritual awakening, I offer many free essays and also my book, Living the Paradox of Enlightenment, which is also on Amazon, both as an ebook and as a paperback.